This blog contains a collection of accounts and photographs of the women who attended Wilson College since its founding in 1869. Wilson College women were pioneers in medicine, science, missionary work, women's suffrage, business, education and more. This first collection will focus on more than eighty Wilson alumnae who were missionaries in fourteen countries and regions around the world from the late 1800s through the 1940s. Betsie Hopkins married James Crothers a year after graduating from Wilson College. James was a graduate of the Princeton Seminary. Alumnae Quarterly (AQ) February 1948: "Would that is were possible to let you read, in their entirety, the two letters we have received from China. Both Pauline Landes Browne and Betsie Hopkins Crothers are enthusiastic about their new work. Betsie and Jim, with Johnny, aged 5, Didi who is 3, and 2 year old Helen, are living in Peiping China. Betsie has a class at the Women's Union Bible Training School, is chairman of Presbytery's committee on women's work, and helps in the Sunday School at the Ku Lou Church. Jim works with the Rev. Shao Feng Yuan on the youth program of Presbytery, is comptroller of Truth Hall Middle School, teaches Bible classes and directs a choir." AQ August 1949: "A long and most interesting letter has come from Betsie Hopklins Crothers, written in January from Yenching University near Peiping, China. Communist-occupied territory. If only you could read all of it. She tells how they stayed on during all the dangers of the occupation. She says that during it all their great joy has been the calm faith of most of the Chinese Christians and their steady persistence at their jobs." AQ November 1949: "Through the blockade which evidently cuts off ingoing first class mail, comes another letter from James and Betsie Hopkins Crothers at Yenching, China. Jim will continue at the University, teaching English and doing audio-visual work with seminary students. Son John was seven in July, though the festivity was dampened by Sis's chickenpox. The family gets most home news via periodicals. In the American attitude toward the events in China, they hope for one 'without panic and with an effort at sympathy for the tremendous problems ahead without dropping sincere criticisms, too. A mature American calm would do more than all the relief in the world.' Betsie finds the new movements vitally interesting to observe and certainly preserves her faith and tranquility amidst instability and tension." AQ May 1950: "This year, February 15, brought a touch of Christmas greeting in the form of a printed letter. They are still free to carry on their work at the Yenching University in Peking, China, and are evidently busy and happy in their activity. Jimmy and Helen attend Chinese kindergarten, learning 'an endless number of songs,' Johnny displays his scholastic abilities in a Chinese school, too. Betsie's husband, Jim, keeps up a teaching and recording program and is procuring Bible films to show in churches to aid in presenting Christianity to his students. Betsie teaches English in the University and holds a Sunday School class in Chinese! They say that the University has been an inspiring place to work with its highly efficient co-operative community life. We would not want you to think there are no difficulties. 'The challenge thrown to the Christians is as critical as the Church has ever faced.' A personal lure at the end mentioned 'seeing you' possibly in another two years or so." AQ February 1951: "Betsie and Jim Crothers left Yenching, China, in August, not because of the communists nor because their mission was fulfilled, but for the sake of their three children's health. Far from being pessimistic about the Orient, they feel that through Christian education there is 'a fire upon the Chinese earth which no communist can put out.' Now Jim is working at the Church Board's office in San Francisco and planning aid to Chinese students at the University of California." The following are excerpts from the Memorial Service tribute to Betsie Crothers, upon her death, by her husband, the Rev. James M. Crothers: "Mary Elizabeth Hopkins was born May 10th, 1916, in Saint Joseph, Missouri, where her father was the founding pastor of a Southern Presbyterian Church. The event occurred in one part of the manse, while in another part the midweek prayer meeting was going on. When she was a year and a half old her parents took her to China. The young missionary family was assigned to work in cities along the Grand Canal north of Shanghai. At two year intervals three brothers and a sister were added to the family. Betsie remembered her childhood as a very happy one. She played with Chinese children, feeling very close to them. The one sad event for her in these happy days was the death of the brother next in age to herself. "When she was ready for high school Betsie was sent to Korea, as were many children of China missionaries. At high school Betsie entered into the school life with enthusiam, enjoying both the classes and the extracurricular activities of drama and music. On graduating as class salutatorian, Betsie went back to the China home with very firm plans in her mind for the future. She would go to the leading Southern Presbyterian women's college, Agnes Scott. She would go on to graduate study, she would marry her childhood and high school sweetheart, George Stevens, when he graduated from medical school, and then the two would go to China as missionaries. But suddenly her well-planned world fell apart. After only a 24 hour illness George died of a rare disease. Betsie wept for days, weeks, months. But this year before her return to America did have its plus side, for she was recovering the Chinese language she had lost in four years in Korea. And as she retraced the places she had lived along the Grand Canal, she was seeing the scenes of her childhood with almost adult eyes. "The family finances had been greatly hurt by the failure of a Shanghai bank. So Betsie did not go to Agnes Scott, but to Wilson College in Yankeeland where an unusual scholarship paid for her college course. These four years were the happiest of Betsie's life. She reveled in what the college offered, growing in many skills. The year after college was spent at the Westminster Choir College in Princeton. During that year we became engaged, and were married in the seminary chapel in June, 1939. "In addition to the many duties of a minister's wife, for the first three years of our marriage Betsie had to be a nurse and a guardian. Her seriously ill sister was with us for two years, then my sister, a refugee from war in the Orient. The war years of World War II involved much moving, the birth of three children in a little over three years, and such formal study of Chinese as she could manage. "Betsie plunged into the work of a missionary. 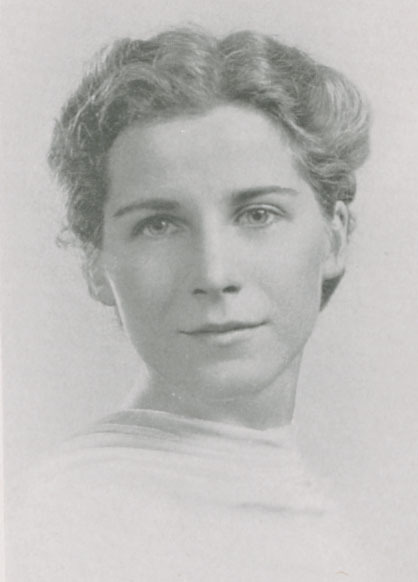 She led a junior choir at the Drum Tower Church, chaired a Presbytery committee on Christian Education, supervised a child care center for refugee children, and lectured at the church training school for women. This last was something I never did - lecture in Chinese. It wasn't easy for Betsie, requiring long hours of preparation. On top of all this Betsie was often called upon to be almost fulltime hostess. The Board of Foreign Missions sent many of the touring dignitaries to our home, for Betsie had the best Chinese of the younger missionaries. "Then in October, 1948, came the advice from the US government that all Americans should leave North China, especially those with small children. This involved a hard decision: were we missionaries representing America or were we representing a church that had no East or West, no South or North? Betsie was among the tiny minority of missionary wives and mothers who decided to stay on under communism. But now our work was outside the city walls at Yenjing University in which the teaching staff had been seriously depleted. There Betsie taught English to the undergraduates and had classes on Christian Education in the seminary. A fellowship of Christian students met in our apartment. Betsie helped these students conduct a Sunday school. When the Korean War started, however, we felt it inadvisable to stay on, and decided to leave. At a farewell reception in Peking the pastor of the Drum Tower Church expressed especial appreciation to Betsie who had let his children and her children play together on the basis of absolute equality. A note from a former student: "Betsie leaves a rich legacy - the example of one who cared deeply about other people."